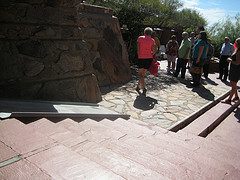 I went out to Taliesin West for a tour today. 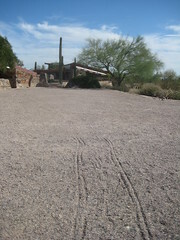 Taliesin West was Frank Lloyd Wright’s winter home from 1937 until 1939. It currently houses the Frank Lloyd Wright Foundation and is one of two campuses of the Frank Lloyd Wright School of Architecture. Until just recently it also housed the Frank Lloyd Wright archives, but in a controversial move, they are being transferred to Columbia University. 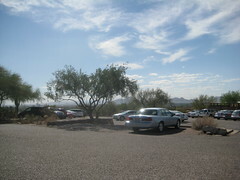 Taliesen West is in Scottsdale, just a half hour drive from downtown Phoenix. The website contains absolutely no information about accessibility. I figured I’d just drive out there and check it out. The parking lot has two permit spaces, neither of which is appropriately marked if you need to let down a lift or assemble a chair. I drove around to the back of the parking lot and parked where I could get the wheelchair out of the car. Then it was off to the bookstore/information center. The bookstore is a new semi-subterranean building. There is a code-compliant ramp around three sides of the building, and a door with an automatic opener. In order to see the complex, you must go on a tour (no wandering around by yourself), and I was assured that the tour was completely accessible! So I bought a ticket. There are two long stretches of gravel. In general the gravel is not too deep or too loose, but there were areas I had to wheelie across. Stairways range from 2 to maybe a dozen steps. If there are two or three steps, they’ve created small concrete ramps. If there are more, there are permanent metal ramps. These ramps are about 30 inches wide and have a very small lip on each side. I got help from other tour participants to get both up and down these ramps. The initial building on the tour (FLW’s original office) has two doors. One of them has about a 22 inch clearance; the other perhaps 26 inches (I got through that one). The final building is the Cabaret Theatre. It has a long walkway that is at best 26 inches wide. Holy crap, that ramp is frightening! I can’t believe they would expect anyone in a wheelchair or walker to be able to negotiate that!! Heck, a person with two working feet might have issues.